A little history with a very fine high tea. I know it has been sometime for our reviews on our favourite pastime (you know what that is) but one's life has been a little busy and a few we have tried just didn't make the grade. However, this one certainly did make the cut. Magiric Emporium high tea is a most lovely experience from the time you enter the lovely old stone cottage until the time you leave. 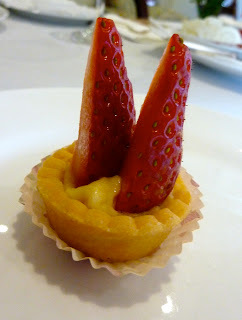 The savoury high tea attracted my attention and a great option for those watching their sugar intake. Our party ordered two savoury and one traditional along with tea and coffee. Service is very prompt and attentive, refreshing the tea pot or replacing plates not a problem. The savoury scones, topped with sour cream and homemade tomato relish, are the best I have ever tasted. Yum. Both savoury and sweet selections are equally impressive as the choice of teas on offer. Magiric Emporium has such a lovely variety of foods, catering for elegant luncheons, private functions and the hardy high tea lovers. I would recommend if you're Busselton way, do yourself a favour and enjoy this excellent experience. Very well done. Im really lucky to find you post! You are surely doing a right thing. After carefully reading, I find that your article interest me. Do you drink Chinese Tea as me? Where you usually get your tea and teapots? Local mall or tea related websites?